Group messaging has always been available in Android. But we need a short definition of terms here. This is “group text messaging” – where the recipients are contacted through the older SMS or MMS method and not private messaging through the internet. Group messaging is possible in Android. From my experience, I’ve seen how Android users have had a bit of a hard time figuring this feature out. If you’re a new Android user who just jumped on to Android from an Apple iPhone device, I understand why it would be difficult. A huge bulk of the difficulty with this feature is because some users have had a bit of an easier time from using an iPhone. Apple has a different approach when it comes to its interface – the less complicated, the better. Hence, when you start a group text messaging session with the iMessage app on an iPhone, the first option will always be that the messages will go through Apple’s own messaging servers. Though users might think of it as using SMS, it actually isn’t. Apple does group messaging differently from Android. In this case, Apple is able to treat the group text session much like an internet chat session – hence you can send all the messages to the recipients, and all replies appear together in one session. This only happens if all recipients are iPhone users and are using iMessage as their default messaging app. If you add a non-iPhone user, the messages will arrive as SMS, but they will not be able to see all replies from other users in the group. Therein lies the problem. When iPhone users jump on to a new Android smartphone, they expect this automatically. And although this can be done in Android, this group messaging feature needs MMS (multimedia messaging protocol) to be activated. So here’s my way of clarifying this feature for you, and giving you a comprehensive once-and-for-all guide to group messaging in Android. Why Would You Want to Send Group Texts on Android? So why would you need to send group texts? Let me digress a bit and clarify two things. First is “mass texting” – which is sending a text to multiple recipients, but not needing everyone to see the replies. The replies will just go to you alone. This is not what we want. Mass texting just used the SMS protocol – and just sends one message to a number of people, regardless of the replies. Group messaging is like a chat group, but not with an internet connection. Group texting means sending a message to a number of people, and then all people in the group would be privy to all the replies within the group. This means that all messages go out to all of the members in the group. So why would you want to do this if you can do a group chat over WhatsApp or Facebook Messenger? Well, group messaging is actually useful in areas where the data connection is not so good, and you still want to be able to have chat-like features. For this to work, you need to tell your Android operating system what default protocol to use for group messaging. In this case, only the MMS protocol will work. And everyone in the group must have MMS activated for group text messaging. Group messaging in Android requires the use of the MMS protocol, so this is the first step to check. Android either does “mass text” or “group text” – and users will need to toggle their messaging app’s settings so that the group texts go through the MMS protocol. First, you need to open up your messaging app. For us, it will be the Messages app from Android, but it should be pretty much the same with other stock messaging apps. Toggling your group messaging settings to MMS is the first step. Then you need to go into Settings > Advanced. Under the Group Messaging section, make sure you toggle the “group MMS” option. This will change the global action for whenever you try to send an SMS message to multiple recipients. Auto-downloading MMS makes sure you receive group messages immediately. Also make sure that the setting for Auto-download MMS is toggled on, so that you will receive all replies to the group chat automatically. Having this toggled off will mean an annoying notification will come up every time a member of the group replies. IMPORTANT NOTE: Depending on your mobile carrier, sending messages over MMS might count against your data limit. This means that when you go above your data limit, sending group messages might actually cost you some money. Once the MMS settings have been toggled correctly, you can now do group messaging via your standard SMS app. All the messages will be sent to the recipients, and everyone will receive the replies just like a group chat. Starting a group messaging session is now easy. From your contacts, just choose the people you want to start a group chat with, and then send a message to them. This will go out through MMS and everyone will receive the any reply made to the group. As long as the MMS settings are toggled, you can even send group messages to your iPhone-using friends. By that, I mean that you can include them in your group messages and not fear that they won’t see the replies. When you send group messages using MMS, the iPhone will also use MMS via the user’s mobile carrier and be able to display replies to the group via the iMessage app. Android MessagesIf you want Google’s stock SMS messaging app, you can’t get as fundamental as Android Messages. This is the app Google wants you to use on Android for SMS messaging.Don’t be fooled by the basic layout. This contains all the SMS messaging features you need – including group messaging – in one clean app. And if you make it your default messaging app, it will give you that stock Android look and feel. Handcent Next SMSHandcent was one of the first robust SMS apps there was, and it’s not surprising that a lot of people still use it to this day. A huge number of updates later, Hancent is still here.The app goes by Handcent Next SMS these days, and from the name of the app, you will understand that it is still an SMS app at the root. The great thing is that the app includes a lot of features – including the capability to do group messaging. GroupMeGroupMe is probably the most popular app that hangs on doing one feature great – group messaging. It doesn’t matter if you’re on the internet, on MMS, or on SMS, the app will do group messaging in one way or another.GroupMe is owned by Microsoft and it may seem like a chat app to most, but at its core, it really wants you to chat or message with multiple contacts at one time. GroupMe prides itself in keeping all your chat groups organized.The app will allow you to do one-to-one messaging, whether connected or via SMS. But its strength is really making it easier for you to connect and message groups of people from your contacts. Textra SMSTextra is one of the best SMS apps you can get out there, bar none. The app is popular with people who want to have an SMS app that gives a lot of customization options and a robust list of features.Textra is one of the highest rated SMS apps in Google Play, and that’s because a lot of people are satisfied with what the app brings to the table. Of course, among its features is group messaging.Must Read: Text Message Background: Apps, Themes and Wallpaper DownloadsThe app also plays nice with Android Wear, Pushbullet, MightyText, and other apps, so its no surprise that you have to pay USD$2.99 to use all the features. That said, most of the free-to-use features already make it a solid messaging app. After using MMS as your default group messaging protocol, you might come across a situation where you would want to use plain old SMS – which means you can send one text message to multiple contacts, but have their replies sent only to you and not to the whole group. To disable group messaging in Android, toggle your group messaging option to mass text. To do this, you will need to go into Settings > Advanced. Under the Group Messaging section, make sure you change the selection to the “mass text” option. This will change the global action for SMS messages, and you will get an individual reply from each contact you have in the group message. As useful as the group messaging feature is, there are times when it creates some problems with users, so allow me to get into some of these so we can get you sorted out. Group messaging can sometimes cause problems. This happens when your group messaging protocol is set to mass text (SMS) instead of “group MMS”. When you send a group message that is a mass text, your phone uses the SMS protocol, and so replies will come to you only, and they come as individual text messages. You need to switch to group MMS – as detailed above – so that replies to the message are sent to the group. Unfortunately, this can’t be done in group messaging. If you use a chat app – like Facebook Messenger – this is easy as pie. But with standard Android group messaging, this isn’t quite as easy. If you really want to add someone, this means that you have to start from the beginning and add everyone else – including that person you missed out – and start a new group message. Again, Android has not made it easy for us to get out of a group MMS. There is a workaround for this, but you can’t really delete yourself from a group messaging session. The workaround would be to stop receiving notifications from the specific group. You open your messaging app, hold down on the specific group message, and toggle the notification settings. Make sure that you set it so your phone won’t notify you even when messages come in. At this moment, there is no way to extricate yourself from a group MMS session – so be mindful when creating group messaging sessions. Make sure everyone wants to be in it. Final Thoughts: Is Group Messaging Still Relevant Today? 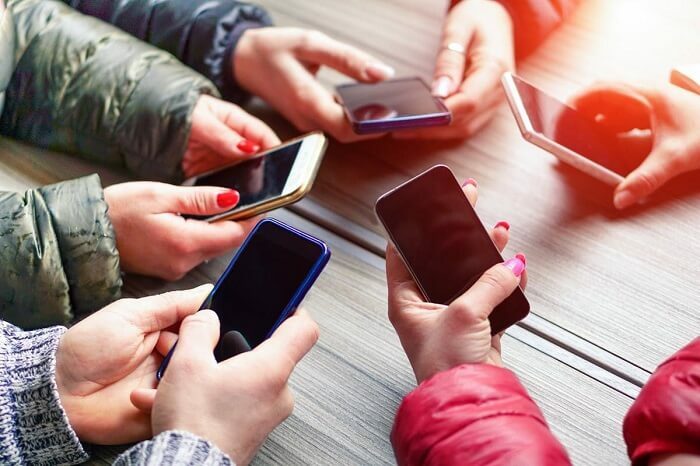 All of us will agree when we say that there are now better options to message a group – with internet or data connection. Facebook Messenger or WhatsApp are good examples of this. But I would think that in areas where data connection is not available, and all you can get is MMS – then a group MMS would be the best way to do it. Have you tried group messaging on Android? Is there a particular app that you use to make it easier? Share it with us in the comments section! © 2019 InterDigitel Private Limited, All Rights Reserved.